← Save London Murals! Hokusai Wave Mural Restoration Update! Hokusai Great Wave Mural Update. Dulux donate paint. We have just received the great news that Dulux ‘Let’s Colour’ have agreed to supply 60 litres of paint for the Hokusai Great Wave restoration project. We would like to thank Dulux for their kind support and commend the work of the Let’s Colour programme across the world (see link) . This entry was posted in London Mural Preservation Society, Restoration and tagged Camberwell, Dulux, London, Mural, Restoration. Bookmark the permalink. 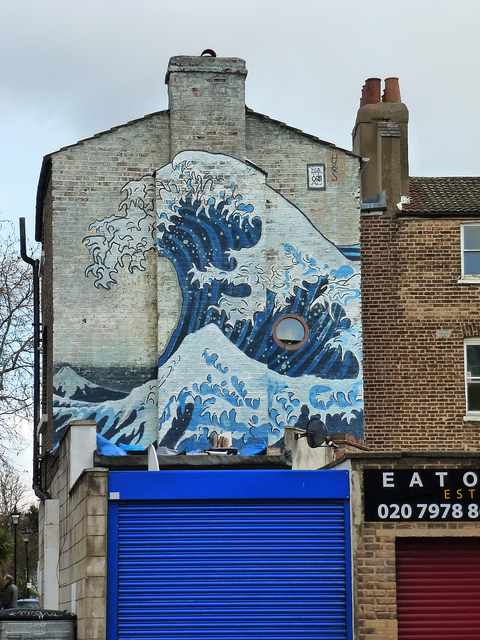 2 Responses to Hokusai Great Wave Mural Update. Dulux donate paint. We used to have an almost identical mural in Georgetown, Washington, DC USA. In those days however, murals were associated with low income neighborhoods, so it got painted over.